On my commute this morning I re-listened to a shiur about the life of the Rav Kalonymus Kalman Shapira zt’l, the Rebbe of Piaseczna. The shiur (#2 of a series), given by Rabbi Zvi Engel of Cong. Or Torah (Skokie, IL) is great, but what I realized is that he mentions that Herzog College published a biography of the Rebbe written by Dr. Ron Wacks (Wax). They also had a yom iyun about the Rebbe and part of the event included Rabbi Dr. Tamir Granot singing of a niggun Hashkata (silencing the mind), composed by the Rebbe. I believe the niggun was tracked down by Rabbi Dr. Zvi Leshem, as he teaches it in shiurim available here (thanks to Shmuel). Allegedly there is a video online (somewhere) of Rav Granot singing the niggun. After much searching, I did find this gem online. The niggun can be downloaded here. Teach me Your way, O Lord; I shall walk in Your truth. Unify my heart to fear Your name. For a great post and video about the Aish Kodesh’s technique of quieting the mind, check out this. This entry was posted in mp3 shiurim, Piasecna Rebbe on June 22, 2012 by Neil Harris. 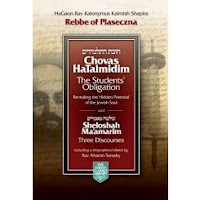 Originally translated and published in hardback in 1991 (and paperback in 1995) by Aronson, Feldheim has just republished a new edition of Chovas HaTalmidim by Rav Kalonymous Kalman Shapiro zt”l, the Piaseczna Rebbe. Feldheim is offering a fantastic intro price of only $19.99 for this volume which is over 640 pages. It seems that from their website, Feldheim plans to reprint many of the Rebbe’s works in English. I’m guessing that this is similar to their republishing of R Daniel Korobkin’s translation of the Kuzari. While I happen to own the original verison of A Student’s Obligation, I’m looking forward to the new edition, since I believe it will have the Hebrew, as well (I’ve been bugging my seforim store about this since before Chanuka). I cannot even begin to explain how moving and influential this sefer has been to me. Originally published in 1932, the lessons with it seem as if they are written for us, today. I have previously blogged about the sefer’s introduction here. This entry was posted in Piasecna Rebbe, seforim on December 29, 2010 by Neil Harris. I had posted briefly before about this project by Yaacov Dovid Shulman. Recently I’ve had an urge to reread his transation of B’nai Machshava Tovah by Rav Kalonymus Kalman Shapira z’tl. Reb Yaacov Dovid’s translation, titled, “Experiencing the Divine: A Practical Jewish Guide” is a very welcome change from the original translation. What I am fascinated by is that the Guidance and Principles and the Rules of the Group are very similar to the concepts and goals of the ‘traditional’ mussar va’adim of the Mussar Movement. The entire translation is available here. Comments are welcome. 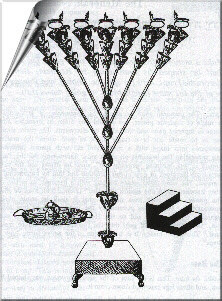 This entry was posted in Mussar, Piasecna Rebbe, seforim on April 1, 2009 by Neil Harris. The sefer, Chovos HaTalmidim, A Student’s Obligation, was published in 1932 and written by the Rebbe of Piazeczna, Rav Kalonymous Kalman Shapiro, zt”l. The sefer, itself, is powerful. 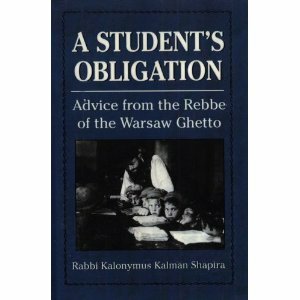 However, the introduction sheds light on students and children leaving the path of Torah Judaism. I have posted a few pages of the introduction to this sefer here. The Piazeczna’s description and advice for those “at-risk” speaks to both the young and old, the BT and the FFB, those burned out and those go through the daily motions of Yiddishkeit. It is almost hard to believe that it was first published over 76 years ago. In light of several posting recently (Rabbi Maryles, Dixie Yid, and two from Little Frumhouse on the Prairie) I had been think about posting something myself, but that will have to wait. If you are in chinuch or a parent or find yourself thinking “do I really need to make a bracha after I eat?” or notice you speed through bentching Shabbos night so that you can get to sleep really early then you really need to read what the Rebbe writes. These pages are not meant to be read while stopped at a traffic light on the way to work or while waiting in line to pick up your kids from school. This is the real deal! I would suggest printing them out and setting aside a few minutes Shabbos night in a comfortable chair with a cup of mint tea and absorbing Rav Shapiro’s persepctive. Please click here to view and download these few pages read the words of this Tzaddik. This entry was posted in chinuch, Piasecna Rebbe, seforim on November 4, 2008 by Neil Harris. כ וְאַתָּה תְּצַוֶּה אֶת-בְּנֵי יִשְׂרָאֵל וְיִקְחוּ אֵלֶיךָ שֶׁמֶן זַיִת זָךְ כָּתִית לַמָּאוֹר לְהַעֲלֹת נֵר תָּמִיד. Rav Hirsch zt”l says on the words l’halos ner tamid, to kindle the lamps continually, that only this term is only used for the menorah. We are taught that one must hold a flame against the wick until wick burns on its own. 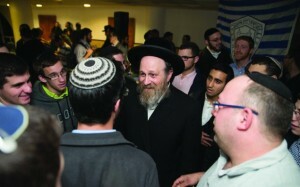 Rav Hirsh goes on to say beautifully that this is how it should be with with the teachers of Klal Yisrael. They should have patience and be persevering with each student, so to light a flame that will burn on its own. Rav Hirsh published his commentary on Chumash in 1878. The same idea put forth, almost 50 years later. Two distinctly different Gadolim, using similar imagery. And why not? Neither Rav Hirsch nor the Piazeczna were interested in promoting themselves, they only wanted to teach us, so that we can continue to burn! Have a great Shabbos Kodesh. This entry was posted in Hirsch, parsha, Piasecna Rebbe, seforim on February 15, 2008 by Neil Harris. Today, the fourth of Cheshvon is the yarzeit of the Rebbe of Piazeczna, Harav Kalonymous Kalman Shapiro, zt”l. 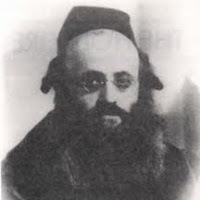 Sixty-three years ago he died al Kidush Hashem in Treblinka. Some of you might be familiar with this Carlebach story. Others in the New York area might be familiar with Cong. Aish Kodesh, named in memory the holy rebbe, by Rav Moshe Weinberger. Just after the Holocaust, a construction worker found in Warsaw found a container buried underneath some rubble. In it contained three manuscripts of his writing, with instructions for them to be sent to Eretz Yisrael with the intent of publication. 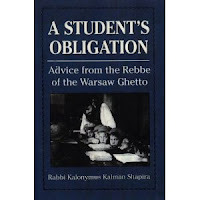 It is a source of strength for me to know that even in the darkest hours of his life in the Warsaw Ghetto, Harav Harav Kalonymous Kalman Shapiro had the vision and faith that his writings would survive. Over the years, B”H, they have been printed and translated into English (which is how I am familiar with his writing). One of his lesser know works is the English translation of the journal he kept between the spring of 1928 through the winter of 1939, titled TO HEAL THE SOUL and translated by Yehoshua Starret. I have owned a copy of it since it’s publication in 1995 and often reread it. I have found his journal to be a unique insight into the mind, heart, and life of a true tzaddik. It’s somewhat, for lack of a better word, strange, to sit and write about someone who was nifter 27 years before I was born. Yet, I feel a loss for a generation of yidden that were taken from us, that I will never know. I can think of nothing more fitting than to post three selections from the Piazeczna’s journal on my own blog, my own digital journal. He who knows his place. Be creative and contribute to the world, give it the best you have. Make a niche for yourself that will always be felt in the world. Are not the “places” of our forefathers, the prophets, and other tzaddikim to this day not known in the world? What a void there would be in the world if, for instance, there had been no Baal Shem Tov? It is much easier to devote many years to diligent learning and even to engage in maximum self-denial than it is to devote one day of your life to serve God honestly, sincerely, and properly even according to your own understanding. But who do we think we are and what great service would we do in this one day, “even according to our own understanding,” that such an undertaking seems so overwhelming? This entry was posted in personal, Piasecna Rebbe, seforim, Weinberger on October 26, 2006 by Neil Harris.